As part of my ongoing collaboration with Domaine Home, this month I was asked to share some holiday decorating tips. As an actor, it is my job to transform and to entertain, and as a wife, mother, and hostess, there is nowhere I love doing this more than in my own home. The holidays, and Christmas in particular, offer the most idyllic opportunity for me to treat my house to a full makeover. I love to cozy it up from corner to corner with scented candles, a hearth fire, the living Christmas tree’s glow, with sheepskins and heirloom ornaments setting the scene. 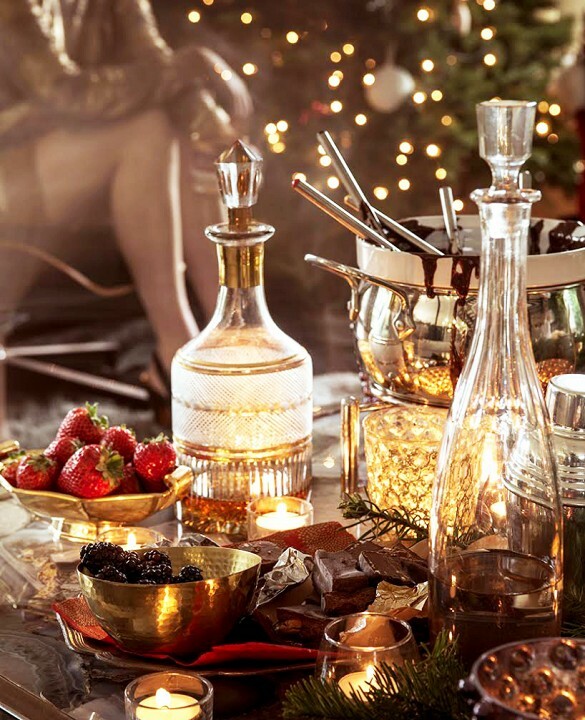 Not to mention, what better excuse for chocolate fondue than a holiday gathering? The holidays are magical as a child, and I’ve found that with some attention to detail they can be equally sweet as an adult. Keep reading for my festive décor tips, and happy holidays from my home to yours. Tip #1: Invest in low-maintenance flowers that will last all month long. I love to decorate with fresh pine, so I always do garlands, but I additionally throw in bulb flowers around the house to bring some brightness in with the darker greens and reds of the holidays. One of the great things about bulbs is that they are beautiful from the start all the way to when they bloom. There is this excitement each day as you watch them grow, which builds, leading up to the celebration of Christmas and the holidays. I do big arrangements of paperwhites and amaryllis in everything from old wine buckets to urns. You can find these bulbs at gardening stores and even places like Target. They last for weeks and are extremely low-maintenance – two pluses in my book. Tip #2: Go eco-friendly with your tree. I really love the idea that you can get a living tree that is potted with its roots, and after the holidays are over, get it replanted. This is a wonderful way to be eco-friendly around the holidays, so you can feel good about yourself and supporting the environment. Plus, it couldn’t be more simple! You just pick the tree you want, they deliver it to your home, and after the holidays it’s returned to the nursery where it can continue to grow. For more information, click here. Tip #3: Indulge your guests with a playful treat. Want your guests to mix and mingle? Whip up some dark chocolate fondue and make it a centerpiece. Your friends will be unable to keep to themselves when they’re swarmed around the table! I serve mine with kettle chips, but you can also do berries, Rice Krispies treats, or any variety of other goodies. After all, what’s not better when dipped in chocolate? Get the complete recipe here. Tip #4: Start a tradition with your festive décor. The rest of the year you can put the uncompromising emphasis on chic; this is the time to go for the charm. It’s all about the personal touches. I have a huge collection of snowmen and Santas that my mother, my sister, and I give each other every year; our exchange is sentimental in all of the best ways. You’ll see all of them mixed in with the garland, holly, and red berries. I love looking around my home and taking in not only the holidays, but also my personal memories of them through the years. Tip #5: Lighting and scents are everything. When guests are over, I rely mostly on candles, the Christmas tree, and fire for light. It gives the space a cozy, intimate feel. I like my house to have a woodsy vibe, so I will put out some pine-scented candles or Diptyque’s Baise, which is my favorite. If you don’t want to overspend on candles, a room spray is the perfect substitute. Tip #6: Create a cozy environment. You want your guests to feel at home, so creating a comfortable place for them to sit is key. I love to buy a couple of sheepskins and throw them in front of the tree and around the fire on the floor as relaxed, casual alternative seating. It suggests that warm, cozy ambience that defines hosting around the holidays!